A chipotle, (pronounced chi-POT-lee), is a smoke-dried jalapeño chilli, used in many Mexican recipes. 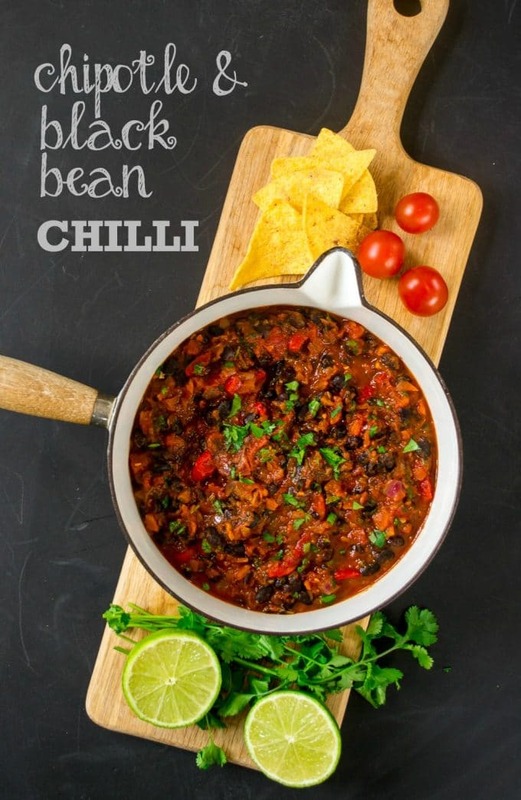 Chipotle paste, (which is fairly easy to find in supermarkets these days), has a distinctive smoky flavour, and adds a lovely warm and deep spice to a simple chilli like this one. 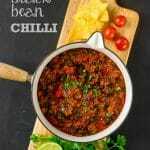 This quick and easy chilli is incredibly versatile, I use it as a jacket potato filling, in fajitas or tacos, with rice and guacamole for a Mexican feast, or scooped up in a handful of tortilla chips for a speedy lunch. 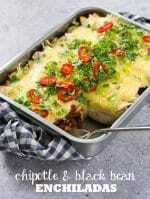 It also freezes really well, so if you want to batch-cook over the weekend, you could double or treble this recipe and bag it up in individual portions, pop it in the freezer once cool, and enjoy over and over again for dinner in a hurry. 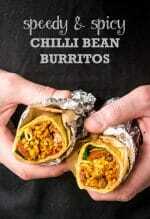 Freezing spicy foods tends to tone down the chilli somewhat, so be bold with the chipotle paste! 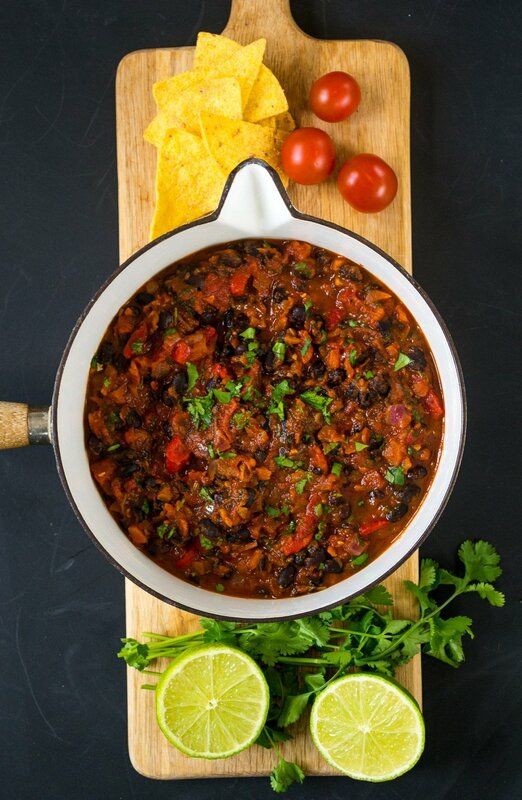 This Chipotle Black Bean Chilli is part of my 20 Minute Meals series – speedy vegan and vegetarian suppers to cook in a hurry. 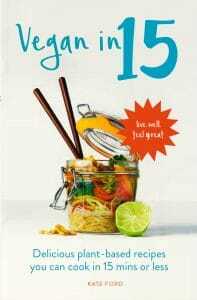 Click here to see the rest of the series, or take a look at my latest book Vegan in 15 for even speedier recipes! Heat the oil in a large lidded frying pan or casserole. Peel the onion and carrot, and separate the coriander stalks from the leaves, (setting leaves aside for later). Use a mini-chopper or food processor to chop the onion, carrot and coriander stalks then add to the pan. Add the garlic and chipotle paste to the pan and stir. De-seed and finely slice the pepper and add to the pan. Drain and rinse the black beans and add to the pan. Tip in the chopped tomatoes and sugar, then season well with salt and black pepper. Stir then cover with a lid and turn up to a high heat. Cook for 8-10 minutes, stirring frequently. Taste and adjust seasoning if necessary. Finely chop the coriander leaves and stir through the chilli before serving with rice, fajitas or a handful of tortilla chips. A common request from readers has been for me to include nutritional information with my recipes, so voilà – here’s a breakdown, and I’ll try to include this with all recipes from now on, (except the really indulgent cakes etc, when I think its definitely best not to know how many calories you’re consuming….!!). I love how simple and quick this is. 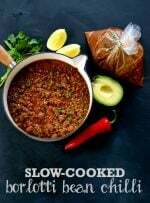 My chilli has a heck longer list of ingredients and takes a lot longer to cook. This would be a great one to try midweek. 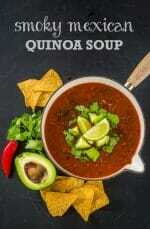 Oooh this chilli sounds so good. 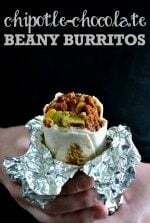 I’ve had a jar of chipotle paste in the fridge for a while and I have all the other ingredients so shall make this at the weekend! Bring on the spice! This looks super delicious, and I love the fact that I could make it ahead of time, and freeze it. ???? I just have to get my hands on the chipotle paste, and then I’m ready to try it out. Please do Barbara! Thanks so much.